Shown here at the 2016 Cleveland International Film Festival, director Kevin Burke's feature is now available for the small screens, so you don’t have to risk getting shot going downtown to see it. Not that the movie isn’t good – but not quite at intensive-care unit level. Which would be a pretty cool criteria for seeing a worthwhile movie, these days. 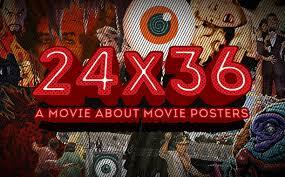 24X36 isn't the first documentary by far to dwell on the nerd-tastic topic of Hollywood movie-poster art – I recommend DREW: THE MAN BEHIND THE POSTER and THE MAN WHO DREW BUG-EYED MONSTERS - but it covers the subject nicely and comes up with a fresh 21st-century twist. The first half-hour tells the history of commercial lithography and mass-poster/lobby production for Hollywood (I am given to understand that the once-great print factories of yesteryear’s Cleveland played a substantial part; all gone now, of course). There are salutes to unsung graphic artists Albert Kallis, Bob Peak, John Alvin and Richard Amsel for their iconographic images, and the footnote that Roger Kastel’s original painting for Spielberg’s JAWS went missing from the printer’s and is now a much sought-after missing piece of art. By the digital age, however, truly creative artistic renderings, paintings and designs in cinema ads and handbills had given way to sterile, formulaic digital imaging - often nothing more than Photoshopped star portraits. But a recent trend (credited to Austin, Texas-based art studio Mondo) has brought brash, new artists to create licensed, limited-edition 24" x 36" line-art posters for revival screenings. Much liked our own Derek Hess’ rock poster art cranked out for single band gigs that take on an artistic life of their own, these short-run 24" x 36" posters brought new visual vibrancy to culty or even downright lousy flicks (who would have believed there was inspiration to be found in HALLOWEEN III: SEASON OF THE WITCH?). A lively collector market has developed, and twist is that the studios have noticed, and the phenomenon may lift the mainstream poster-art production from its current state of corporate banality. Local author and alternative-movie-poster expert Matthew Chojnacki is among those interviewed (disclaimer: Chojnacki and I share the same book publisher, and I would dearly like to steal his identity and hide him away somewhere so I can go to San Diego Comic Con, for a change). Of the filmmaking realm, Joe Dante supplies a director’s POV (we also hear that Guillermo Del Toro also places a high priority on cool posters and the alternative movement).